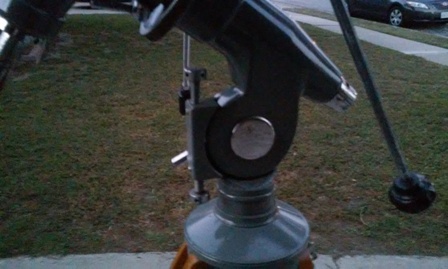 On a recent RV excursion I was fortunate to acquire this Mod 106 3" Goto refractor. Dates from December 1958 and is very complete. The OTA has a few small marks but otherwise is pristine. 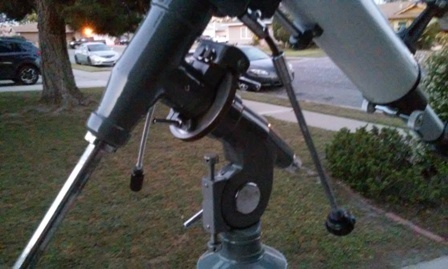 The mount is in the same overall design as the other two Gotos I have with sliding saddle plate two bolt attachment, and at the same time contains components of the 4" mounts. 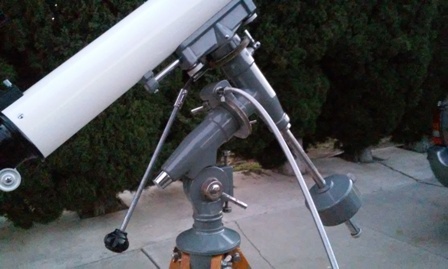 The legs are different from other Goto legs for this size scope, fitting between the fixed legs for the 4" and the field legs. It also has the wire spreader arms of the Mod 105 legs with the remnant of the bakelite spreader pan and bolt. Another missing part is the RA u-joint slow motion control. 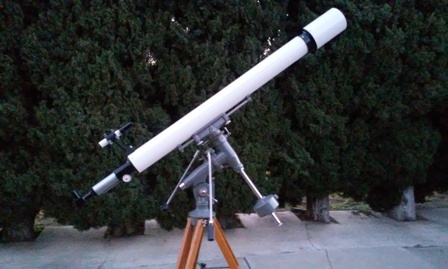 It came with H6mm, H9mm, H12.5-25 convertible eyepieces, porro prism erector, solar/star diagonal, sun projection screens and rod, and lens cap. Finder is also pretty much unmarked from ring setting screws. As nice as the tube is, the chrome could use some work. All of those parts are removable though so possible to rechrome pretty easily. I do like the simplicity of the latitude adjustment 'box'. It came with a T-handle wrench for the Az bolt that I'm not sure is original and not marked Goto. Always a joy for me, it has those marvelous Goto leg bolts. 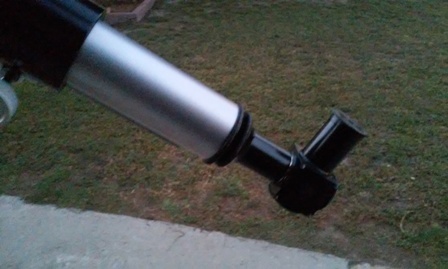 Optics looked good on Jupiter at 218X in stable SoCal air early one evening, but it needs to be collimated. I will not be using the lens cap after doing so, as I think terra's comments about it's possible effect on collimation sound credible for this model. We'll see how it works out when I get the time to do so. 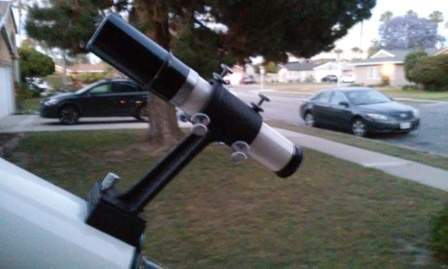 Acquiring this scope was really a wonderful surprise opportunity I couldn't pass up. It completes the upper end of the GK line for 1957/58 time frame for me. And of course more to compare and contrast with regard to innovative touches that GK was incorporating during the period. Pictures were taken at dusk so apologize for quality. It's gorgeous! One thing I later found when running my index finger inside the rim of my 3" Goto's cool bell-snapped objective cover is that someone had placed scotch tape in there long ago. After I removed the tape and all the old adhesive residue it fit much better and didn't bind with the cell when pulling the cap off. The lens cap is clean on the inside and a slightly snug fit. I think the scope spent a lot of time with it on and not many cycles of removal and replace. It was properly set up though with that dovetail finder right on the money as to H6mm (218X), well in the FOV for objects. Nothing of note on the accessory optics except dust and grunge that should clean up fine, but also is needed. 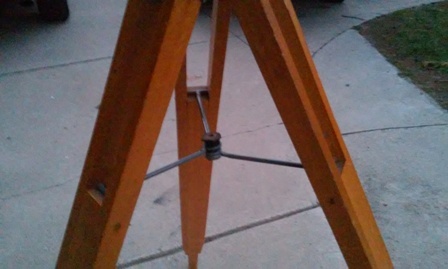 The tripod does not have metal feet. Simply dead as to vibration on ground or concrete. Really aware of the replacement springy arm RA slow motion control wobbling around in the eyepiece view though so will build a replacement u-joint arm but not be able to duplicate easily the Goto flat knob. The 4" 204 also was missing that part and I will make two of them the same. U-joints were available on Ebay. Just need rods from HD and that locking socket for the RA shaft, which will likely be the difficult part. And JW has sent me picture of the size of the bakelite pan that holds the spreader arms and I'm sure it is the same as the one Dave Trott has for his 105 so I should be able to get something turned in aluminum and paint if brown to mimic the bakelight for both this 106 and my 105. No provision apparently for setting circles. They weren't offered on this model. Have you thought of possibility having on printed in black plastic? That might be more like the original? 3D printer tech would require scan of original. Definitely something to consider. I have heard that the 3-printed plastic can be buffed and polished with some solvent to make it smooth and shiny. I believe our own Ben Bajorek posted that? I'm going to take a stab at reproducing the Goto knobs in black urethane later this summer. There should be enough to go around. It has the chance of being of a superior finish to a 3-D printed part, at least requiring a lot less polish and buffing after fabrication. Stew, only the most discerning, intelligent people own a Goto 106. Nice. Are the R.A. bearing surfaces truly conical, or is just the mount's outer casting so shaped? Why would setting circles not be offered on a mount that seems perfect for them? Chuck, thank you. As you are one of the most discerning and intelligent people out here (that I know of), I'm surprised you don't have one of these. Thanks, and the first question I don't understand. If you're asking about the latitude bolt structure, I am sure the two mating surfaces of each half fully encompass the 1" bolt. The RA shaft looks like it would have typical bearings for the period. Goto only offered the setting circles on the 3" and larger 200 series. So my 203 and 204 scopes have setting circles. The 105 and 106 scopes do not. I agree that it is an unfortunate omission. Edited by Stew44, 11 July 2017 - 07:39 AM. I don't see any images of the objective, I suspect these models came with adjustable cells? Yes, and collimation is critical to this particular design. Will get a pic out there. 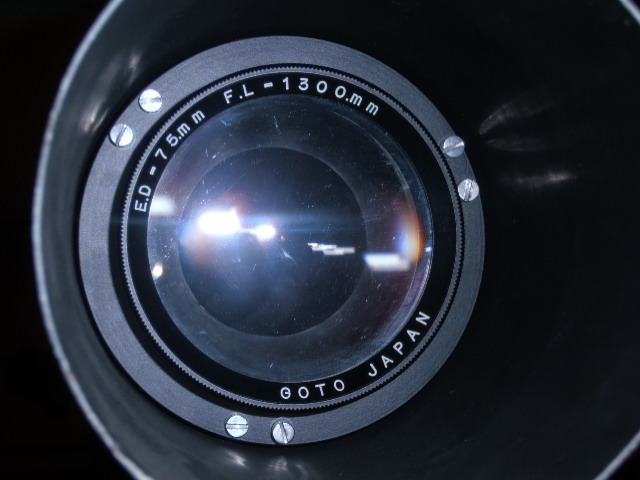 Goto only offered the setting circles on the 3" and larger 200 series. Per the Goto Catalog, the 100 series are School Scopes, while the 200 series are Professional. The list prices make the differences clear! The Goto mounts are darn near perfect. As I've posted before, the features are decades ahead of the pack. Edited by Bomber Bob, 11 July 2017 - 08:31 AM. You'd think school scopes even more should have setting circles. What were they teaching them if not how to find stuff to look at? IIRC, the requirements for the School models were more about durability & functionality -- and maybe daytime use more than night? So I have a three page brochure from '58. You have a catalog??? Can you scan and post to Yahoo Classics group? Please? It lists which models have the "dividing circles". Thanks Chuck, I have that. I call that a price sheet or brochure. JW used the 'catalog' word and that means text, description and pictures. Have a couple of those too, but am hoping for something more than kind of rice paper mono-color trifold. Chuck probably has one of these buried at the bottom of one of his stacks of cases that he's forgotten about. Kinda like the f/20 he forgot about. His memory isn't the same at his age. Aren't you like 3 years younger than me? NOT gonna criticize Old Guys with memory problems: Just had to move a post, myself. Mercy!! Hey, you've remembered more stuff than I'll ever know! Wait, that doesn't sound right. Where is that rather narrow looking baffle?